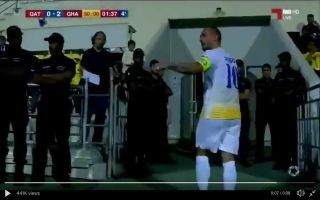 Netherlands attacking midfielder Wesley Sneijder went on a shocking outburst after being sent off in Al-Gharafa’s 2-0 win against Qatar SC last night. Both of Al-Gharafa’s goals came through Sneijder, the 34-year-old scored a penalty during injury time in the first-half and the attacking midfielder sealed the victory with a strike in the 83rd minute. Sneijder then went from hero to zero only minutes before the final whistle and after being shown the red card Sneijder ripped off his armband and stormed down the tunnel.